When your child achieves full school attendance they are able to access their full potential both academically and socially, gaining skills and confidence that will enable them to live a full and rewarding life. Students should reach a minimum of 95% attendance each academic year as good attendance works hand in hand with your child attaining good results in their GCSEs and being able to access their chosen career path when they leave Varndean School. Parents can monitor their child’s attendance via Varndean PLUS. Headteachers should not grant leave of absence unless in exceptional circumstances. The application must be made in advance and the head teacher must be satisfied that there are exceptional circumstances which warrant the leave. Where a leave of absence is granted, the head teacher will determine the number of days a pupil can be away from school. A leave of absence is granted entirely at the Headteacher’s discretion. If a holiday request is not authorised then the absence will be classed as an unauthorised absence. It is Varndean School’s practice not to authorise as we feel holidays should be taken outside of term time. If you need to request time off for your child, you will need to complete a Brighton and Hove Schools leave of absence during term time form. From January 2014, to support improved attendance, Brighton and Hove City Council has changed its guidance to schools regarding requests for absence during term time. This guidance states that the local authority can issue a fixed penalty notice for any request for absence even if the request is for fewer than 10 days. Please read the Brighton and Hove City Council Guidance – Notice to Parents for further information. School starts promptly at 8.45am with a warning bell at 8.40am. Students who arrive after 8.45am will be marked with a late mark. There will be sanctions for continual lateness for the student and parents may be asked to attend a meeting at the school to discuss how the school can best support you with your child’s punctuality. If a student arrives after 9.55am they will be marked as an unauthorised absence. If there are 6 of these in a 6 week period then it is referred to the local authority who will monitor the situation and if there is no improvement issue a fixed penalty notice. It is a parental responsibility to report a child’s absence or lateness daily to the school by phone/text (Phone number 01273 561281 – Absence line). If your child is going to be absent for more than one day, please state this on the message and telephone daily. A text will be sent at the beginning of each day if your child has not attended registration. Please reply if you receive this message as this is a safeguarding measure for the school. A text is sent at the end of the day if your child is absent from all lessons. Please reply by text/phone if you receive a message. If you do not respond to the above, the absence will be classed as an unauthorised absence, which will have a detrimental effect on your child’s attendance and future aspirations. School base will be setting attendance targets for students which will be reviewed every two weeks. A copy of the student’s target will be sent home to parents along with a letter of concern. If the student’s attendance has not improved, a meeting will be arranged with School Leader/Deputy Head of School to discuss attendance issues. Will include parental meetings, Action Plans for students, parental contracts re attendance, home visits, referrals to other agencies, case referred to local authority for prosecution/fines if no improvement in attendance. Overall attendance is improving all the time at Varndean School and to let you know where your child sits with regards to his/her attendance you can look at the RAG (red/amber/green) rating on Varndean PLUS. Government expectations are that attendance below 94% is concerning and our rating is built around this. Lower than 94% attendance represents a learner missing 11 or more days in one school year. Over 5 years of school, 94% attendance would mean a learner missing 55 days or 11 weeks of learning. For guidance on attendance please refer to the Brighton and Hove City Council and the Department for Education websites. 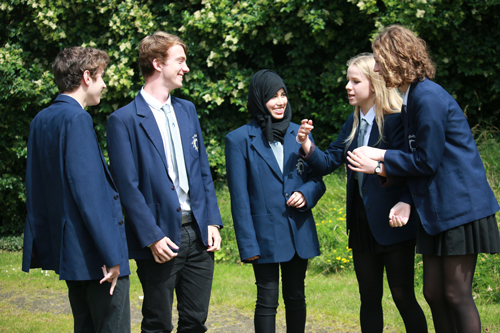 Varndean School’s ethos is to support students and their families who have concerns regarding attendance. Or contact the Educational Welfare Officer on 01273 545 268. Brighton and Hove City Council has issued its new Attendance Code of Conduct as part of a drive across the city to promote and ensure good school attendance. Good school attendance is a priority for all schools, including Varndean School, and ensures that all children are able to develop both academically and socially, improving their life chances. It also has a significant welfare role in safeguarding our young people at Varndean School. The City Council’s Code of Conduct plays an important part in the range of school strategies and policies Varndean School uses to support good attendance and good attainment for its pupils. Please see the Brighton and Hove website for more information regarding the new Code of Conduct, as well as the further guidance relating to persistent absence, how every school day matters and fixed penalty notices. Please also see the letter issued by Brighton and Hove City Council regarding attendance. When there is snow school will remain open unless there is a message to say it is closed on the school website. This will be posted before 8am unless snowfall occurs during the school day and we have to send students home. We notify the local authority who update their website, notify the two most popular local radio stations and send a text message and email to parents and carers.